Ten years is a long time to spend on anything, yet developer Brian Provinciano was determined to see his dream project through to the end. 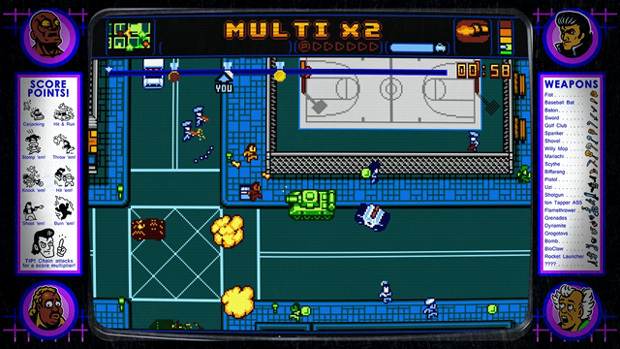 It may have started as a demake of Grand Theft Auto III, but Retro City Rampage is imbued with the spirit of all the biggest games, movies, and pop culture phenomenons from the past three decades. I've been able to take my time with RCR, savoring everything that it has to offer. Chances are most of you have purchased it by now, but for those on the fence or waiting for the WiiWare and XBLA versions to be dated, I'd like to share some kind words. 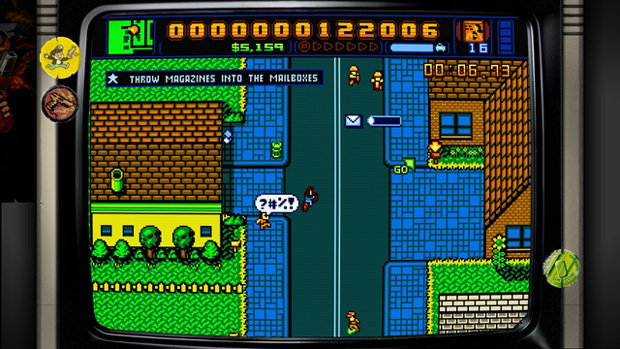 Retro City Rampage has had quite the colorful history. Originally conceived as the NES homebrew project Grand Theftendo, Brian decided to shift development to PC in order to escape the NES' limitations. From then on, the game started to gain an identity of its own. RCR may be an open-world sandbox, but a GTA clone it is not. It is a melting pot of ideas and inspiration, a conglomerate of cameos and pop culture references that are woven into the fabric so seamlessly that it feels like they truly belong together. It's Brian's own Who Framed Roger Rabbit, and the in-game world of Theftropolis is his Toontown. So rich is the city with heartfelt nods to cherished icons of yesteryear that you can't even go 30 seconds without being slammed by a parade of nostalgia. As you cruise the streets, you may notice the Ninja Turtles' Party Wagon or the A-Team's van driving by. Environments and objects straight out of Super Mario Bros., The Legend of Zelda, Sonic the Hedgehog, and more dot the landscape. There's even a boxing gym operated by a man who is totally a dead ringer for Doc Louis from Punch-Out!! A lot of these references are window dressing, so it might be easy to pass RCR off as lacking substance. That couldn't be further from the truth. The biggest references of all are built into the missions themselves, straddling the line between parody and homage but always with love and attention to detail. In one mission, you break into the home of the very Batman-esque Biffman, don his costume, and patrol the streets in search of Biffman's nemesis the Jester. In another mission, you bust onto the set of a Saved by the Bell knockoff during a live taping, beat up the high school boys, then take the girl back to your place for some "iced tea." In yet another mission, you have to dive into the reservoir to deactivate bombs in a recreation of the infamous dam level from Teenage Mutant Ninja Turtles on the NES. These are the kinds of adventures you'll embark upon during the main missions, but you might want to kill some time driving around the street, jacking cars, and mowing down pedestrians instead. The more carnage you create, the more your notoriety grows, attracting the attention of ever more aggressive cops and eventually the military. As with GTA, there's something morbidly cathartic about spreading wanton chaos and destruction -- even more so when the world is populated by pixelated, toy-like caricatures of beach bums, gymnasts, and mariachis. Like I metioned, there is an overarching story. You are a hired thug known only as "Player," who is hurtled through time after stealing Bill and Ted's phone booth in front of a convenience store. Stranded in the future, you are fortunate enough to bump into Doc Choc, who's willing to let you use his DeLorean time machine if you can help repair it. Thus, you must track down the missing pieces of the machine, following leads and taking odd jobs along the way. During your quest, you frequently cross paths with your former employer, A.T. Corp., which holds a monopoly on nearly every industry in Theftropolis, from the media to software development. The biggest thorn in your side is the company's lead scientist, Dr. 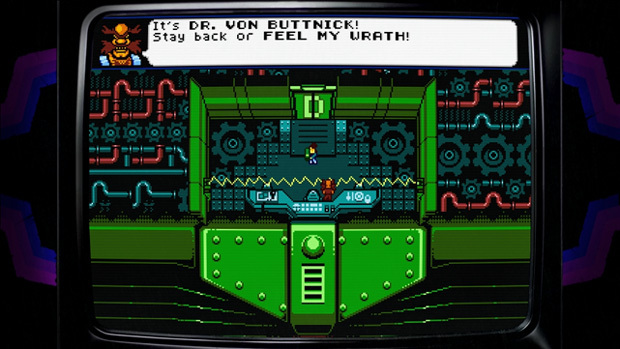 Von Buttnik, who rides around in a wrecking ball-swinging pod like a certain blue speedster's nemesis. In a stroke of hilarious cleverness, Player's conflict with A.T. Corp. sidesteps all player agency concerns. Player claims to be disgusted by A.T. Corp.'s nefarious business practices, which would seem at odds with his penchant for city-wide mayhem. When asked about this contradiction directly, Player flatly states that the two behaviors are not mutually exclusive. By embracing such a contradiction, Retro City Rampage allows you to have your cake and eat it too! Beyond the core levels, you unlock sub-missions that task you with using a specific weapon or tool to destroy a number of pedestrians or cars or to earn a certain amount of points within a time limit. You are then rated on your performance with a bronze, silver, or gold medal, and your score is posted onto the leaderboards. While scoring is typically very straightforward -- link kills together for a streak bonus -- I had serious issues in sub-missions involving handheld explosives like grenades or dynamite. Destroying people or vehicles with these items yields very few points, so the trick is to cause a chain reaction by using the explosion of one vehicle to destroy nearby ones. For some odd reason, this doesn't always result in a substantial amount of points. Maybe I've yet to discover exactly what triggers scoring chains when it comes to explosives, but I find them to be very random, making these some of the most difficult portions of the entire game. Then there are the guest mini-games, starring Commander Video from the BIT.TRIP series, Meat Boy, and even Harley Morenstein and Muscles Glasses from Epic Meal Time. 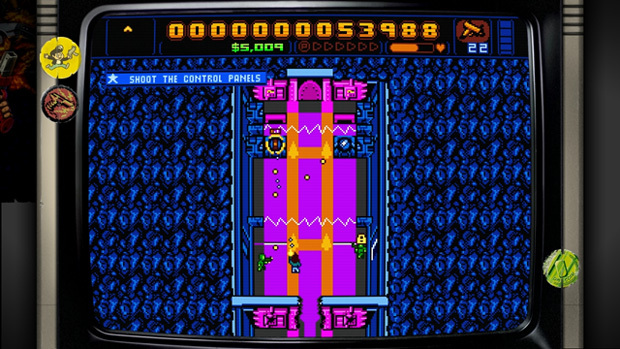 Commander Video's game is an abridged version of BIT.TRIP RUNNER, Meat Boy's takes its cues from Rad Racer (use 3D glasses for stereoscopic mode! ), and the EMT crew's closely resembles "Test Your Might" from Mortal Kombat. Clearing these games unlocks the characters' likenesses in either Free Roaming Mode or in the plastic surgery office alongside the Dtoid crew's mugs. The EMT game is not all that hard, but the BIT.TRIP and Meat Boy ones may make you want to smack your head against a wall. They start easily enough, but the challenge quickly ramps up. 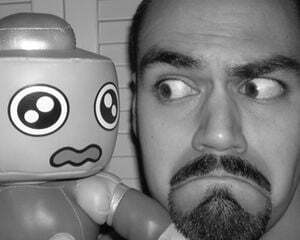 Particularly in BIT.TRIP, I was having extreme difficulty bouncing off alligator heads using the Xbox 360 controller. When I switched to the keyboard instead, jumping became far more responsive. That may have simply been a mechanical problem with my controller, but as I didn't have any similar issues elsewhere, I'm left to wonder. Customization is another major feature of RCR. You can change the border around the game screen to look like various monitors or arcade cabinets, add CRT scanlines, or apply color filters to simulate the look of old console, handheld, or computer software. If you want to pretend you are playing on an old VGA monitor, you can! If you want to recreate the feeling of squinting at the Game Boy's tiny spinach-colored square, that's possible too! Whatever tickles your nostalgia bone, there's an option available to satisfy your desires. Options extend to play style as well. 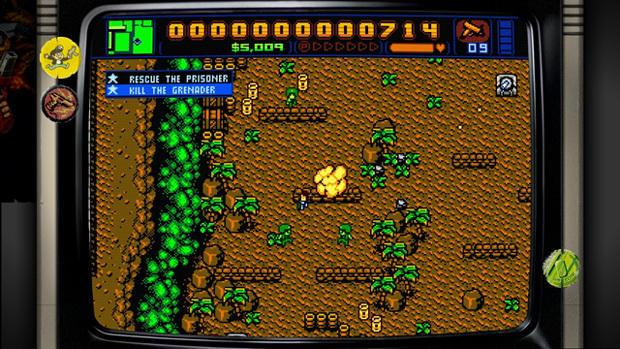 By pressing and holding the fire button, you will lock onto the nearest target in your line of sight, but you can also use the right stick on a controller to enable twin-stick shooting, Smash TV style. You can dispatch enemies either by shooting them, bashing them, or running over them. n addition, you can pull a Mario and jump on their heads, a quick means to escape a tight squeeze when you are besieged on all sides. There's even a basic cover system for fans of Gears of War because... hell... why not? I haven't even touched upon the amazing chiptune soundtrack, composed by notable game composers Leonard "Freaky DNA" Paul (Need for Speed: Hot Pursuit 2, NBA Jam 2010) and Jake "virt" Kaufman (Shantae, Double Dragon Neon) as well as game music arranger extraordinaire Matt "Norrin_Radd" Creamer. Their tunes can be heard on the various radio stations while cruising through Theftropolis, the pulse-pounding bass and melodies giving voice to RCR's marriage of anarchy and candy-coated nostalgia. Unfortunately, the on-screen action at any time can be so overwhelming that it drowns out the music. At its worst, the soundtrack sounds like chaotic noise, hardly the catchy rhythms we associate with 8-bit gaming. That isn't so much the soundtrack's fault as it is the sheer concentration of activity that fills every second of play time, but it's nonetheless disappointing. It's this chaos that serves as both RCR's greatest triumph and biggest failing. To go anywhere and do anything, to never go a minute without being bombarded by visual and aural stimulation -- that all sounds good on paper; in practice, it often comes off as distracting. It's a jumble of events that fly past so quickly that your sense of focus will fall apart if you aren't completely devoted. But that was always going to be a problem, considering the ambitious decade-long journey Brian embarked upon. He wanted this to be his magnum opus, a love letter to everything that ever influenced him or made him smile. At the very least, the game never feels bloated or drawn out -- if you only attempt the main story missions, you'll be done in a matter of hours. However, if you want to lose yourself in the city or embark upon an Easter egg quest, the size and scope make for the perfect playground. 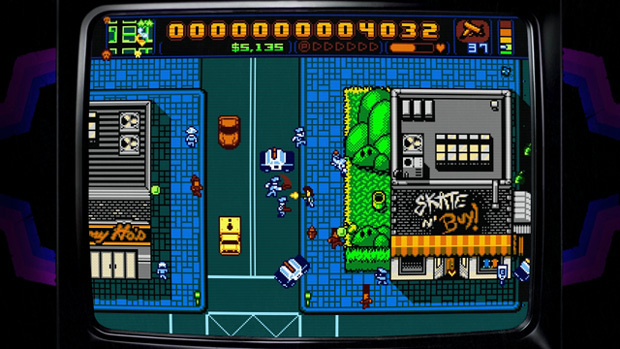 Will there be people who don't like Retro City Rampage? Of course. In many ways, it bites off more than it can chew, especially when it comes to some of the one-time gimmick missions. Regardless, it is an ambitious achievement that celebrates everything that gaming has been and ever will be. It's clever, funny, outrageous, and even a bit frustrating, but there is a genuine respect for both the players and the sources of all the referenced material. I've barely scratched the surface of what secrets and activities are in store, but I'll leave the rest to you to discover on your own.